Perhaps no corps is as easily identified with a particular country as is Pioneer, which over many years has become known for embracing the music of and about Ireland, from the lilting folk music to the abundance of green on the field to the group's shamrock logo. In 1986, Pioneer presented its first Irish-themed show. In 1991, "Irish Festival" started a long line of Irish shows that has rarely been interrupted by music that was neither Irish or from or about the British Isles. 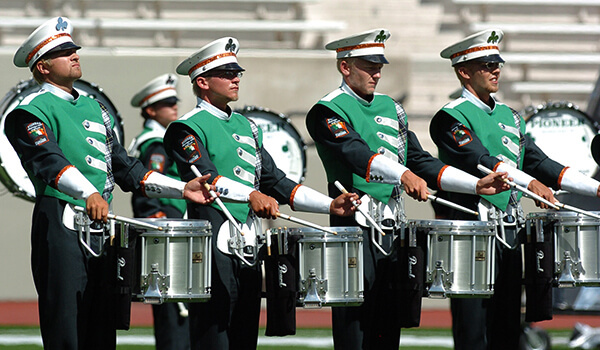 The corps' 2008 production "Celtic Reflections" started with bass drums imitating an Irish bodhran drum, an example of which was up front and played by a member of the color guard. After a jaunty mallet intro and short brass ballad played mostly backfield, the opener progressed into a 25-yard-wide image of a shamrock, leading into "Intermezzo," the second movement of Gustav Holst's "First Suite in E-flat for Military Band." Holst, perhaps best known as composer of "The Planets," wrote the suite in 1909, but it wasn't premiered until 11 years later. At a time when concert bands were still considered poor cousins of orchestras and had little to no music written especially for the idiom, Holst's work had such an impact on other orchestral composers that they too started to write for woodwinds, brass and percussion. Interestingly, since band instrumentation was still in the formative stage, Holst identified only 19 of the 36 parts to be essential, and the rest to be optional. The term "Military Band" didn't mean the piece was written only for bands with military connections. At the time in Great Britain, the term applied to any band that included winds (woodwinds and brass) and percussion. The corps' opener segued into the third and final movement of the suite, "March." Percy Grainger's "Lincolnshire Posy" is arguably the most famous work ever written for concert band. The six-movement composition, written in 1937 on commission by the American Bandmasters Association, was largely inspired by folk tunes the Australian composer notated during a trip starting in 1905 to the English region of Lincolnshire. Interestingly, the work has a connection to Pioneer's hometown of Milwaukee. Three of the movements were debuted by the Milwaukee Symphonic Band, comprised partially of members from the factory bands of Milwaukee's breweries. Grainger referred to the six movements as musical "wildflowers." The corps utilized the second movement of the work, the ballad-like "Horkstow Grange." "Celtic Symphony" was created by the Wolfe Tones, an Irish band of traditional folk instrumentalists named after one of the leaders of the 1798 Irish Rebellion. This was a movement inspired by the success of the French Revolution of a decade earlier that sought to usurp the British rule of Ireland. Clocking in at just over four minutes, it's not a real symphony. The piece is a tad lighter in spirit than many of the group's works, which have a distinctive Irish nationalist tone, as evidenced by so many of the titles in their repertoire. During this piece, the entire color guard was featured on Air Blades, a sleek, modern take on traditional rifles created for and exclusively released by the Band Shoppe in May of 2008, just a month before the DCI season began. This didn't give the guard members much time to get up to speed on the device, helping exemplify the flexibility and prowess of contemporary guards. Sir William Walton composed "Richard III" for the 1955 British film based on the Shakespearean play of the same name and parts of Shakespeare's "Henry VI." It was directed by and starred Sir Lawrence Olivier. Although panned at the time of its release, a re-release of the film 11 years later in the United States made it a smash hit. The corps utilized one of the more regal sections of the film score to lead into "Crown Imperial," another work by Walton that was first performed at the coronation of George VI in 1937. George VI was the subject of the 2010 Academy Award-winning film for Best Picture, "The King's Speech." The visual drill form that closed "Richard III" and opened "Crown Imperial" was the triple spiral, the three-legged Celtic symbol of the female powers of maiden, mother and crone (old woman). 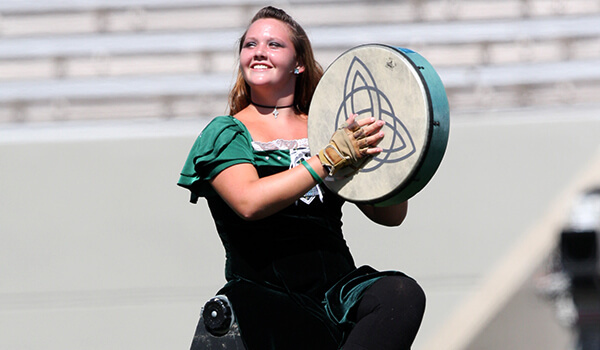 During the backfield chorale segment of Crown Imperial, the corps formed another Celtic symbol, the triquetra, Latin for "three-cornered." Looking like a three-pointed knot, the members of each of the three segments passed through one another prior to a big push to the end of the show. For this week only, you can save on the DVD that contains this complete Pioneer performance, along with all corps from Volume II of the 2008 DCI World Championship DVD set. Buy the 2008 Volume II DCI World Championship DVD. (Available this week only for 20% off. Regular price: $35.95.) DVD offer ends Monday, Feb. 3.